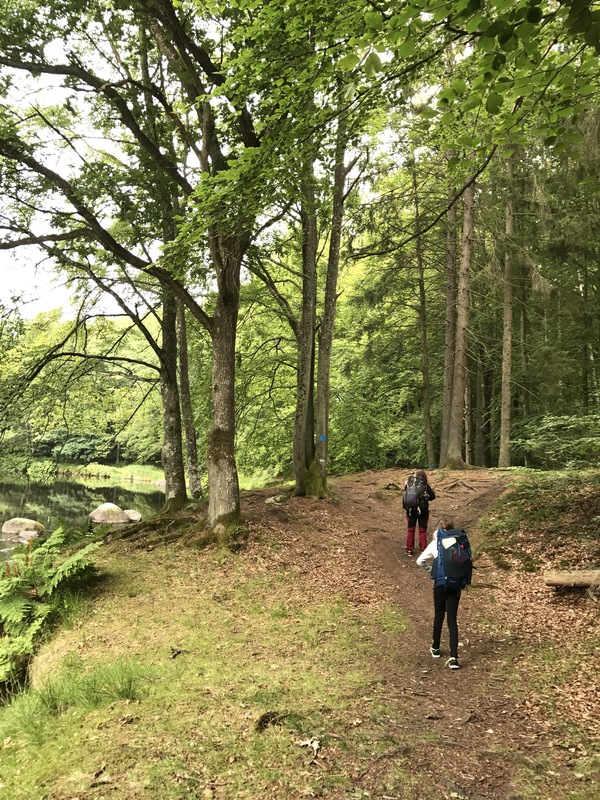 Laxaleden is a 30km long trail in Blekinge, in southern Sweden. It starts near the ocean in Elleholm, south of Mörrum, and follows Mörrumsån north to Hovmansbygd. Mörrumsån is known for its salmon fishing, and all along the trail you see signs of designated spots that you pay to fish at. I haven’t found any designated maps for the trail, but it’s well marked. For printed maps I recommend Lantmäteriets map service and print it yourself. 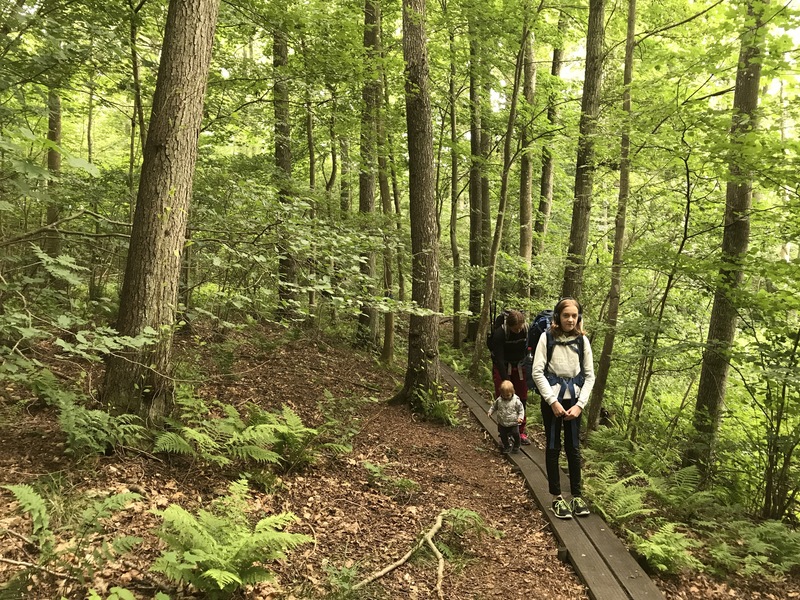 A couple of weeks ago, me, my wife and our daughters decided to do a short overnighter in Blekinge. My oldest daughter was going to visit a friend, and we all wanted to spend some time in the place we used to live in. 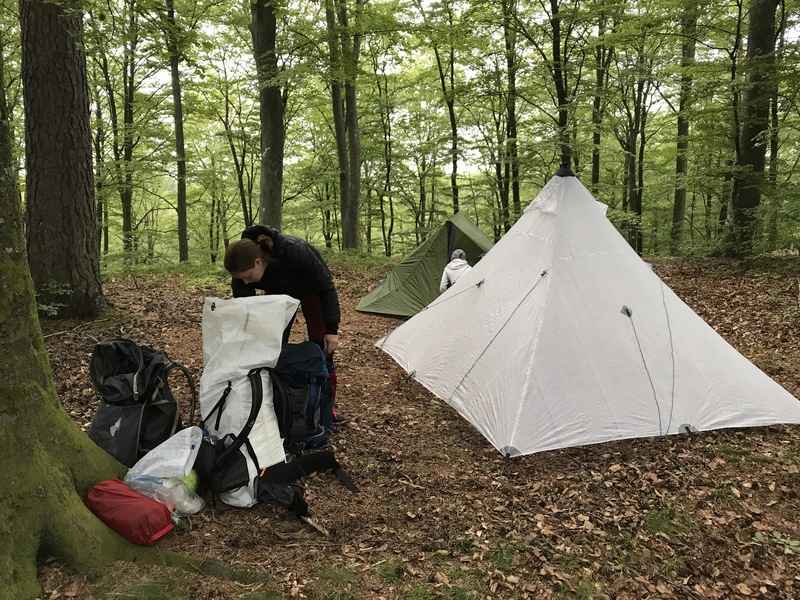 We searched the map for different locations to set up camp, but eventually we decided on parking the car in Mörrum and hike along Laxaleden until we found a good place to camp. We parked the car at the school parking lot in the afternoon, and hit the trail. It passes just outside of the school. We hiked north bound along the shore of Mörrumsån. We didn’t bring the child carrier for Corinne, but hiked in her pace. We knew this would mean a short slow hike, but we had nowhere special to go, and no time table. I like to let walk by herself. Since I had bought a bigger pack for my Sarek trip, my wife used my Exped Lightning instead. 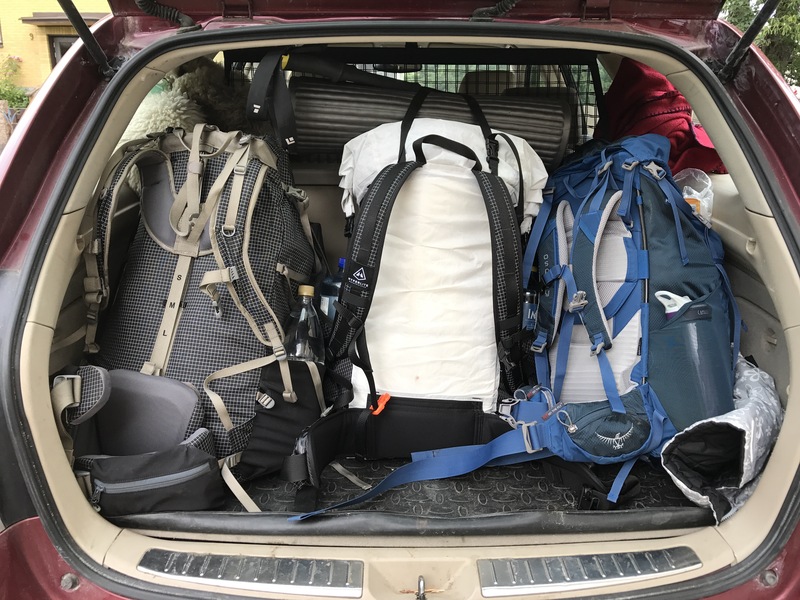 My oldest daughter used her Osprey Ace, a youth pack that we bought for her a couple of years ago. The scenery here is really beautiful, with lots of old deciduous trees, and the beautiful Mörrumsån. We followed Mörrumsån north until we came to a nature reserve. Camping was prohibited inside the reserve, so I walked ahead to see if there were any good spots on the other side. I found a good spot, and ran back and brought the others. Corinne finally got tires of walking, and I carried her the last stretch. My wife and oldest daughter spent some time Geocaching. We set up our tents, and started making dinner. 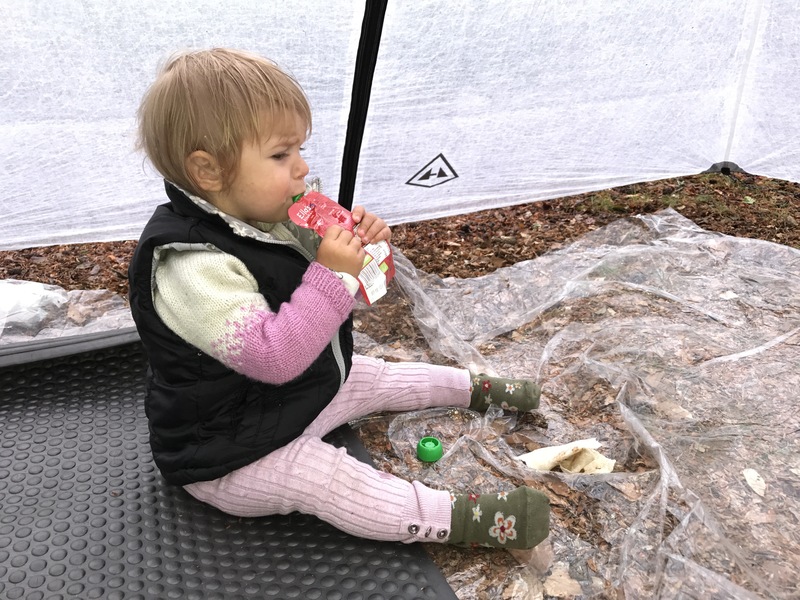 My wife and my oldest daugher shared the Luxe Outdoor Sil Twinpeak, as they wanted an inner tent. Me and Corinne shared my HMG Ultamid 2. I’m slowly getting rid of my bug phobia, and Corinne will hopefully never get one as she gets used to floorless shelters like these from the start. It started to rain during the evening, and the rain continued all through the night. The Twin Peak had started to sag during the night, and they had some slight water coming in. I don’t know if it was from rain or from condensation. I liked to get out like this with my family, even though our son didn’t come along. My wife isn’t an outdoors person and has a worse bug phobia than I do. She likes day trips, but is less fond of overnighters like this. This was the first time we hiked and camped together since we’ve only done car camping trips in the past. But hopefully there will be more trips like these. Well done for you and your family!